Hillstrom hopes his excitement is contagious to his students. He encourages all music majors to improve their overall musicianship continuously. His music theory and ear training students—a variety of vocalists, guitarists, pianists and other instrumentalists—do so with studies in piano fundamentals as well as rhythmic, melodic and harmonic dictation. 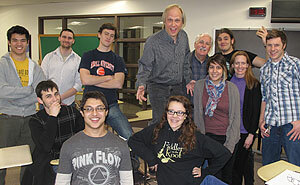 Now in his fifth year at MCC, Hillstrom discusses Stravinsky and many other composers in his music appreciation class. In addition to learning about perceptive listening, music appreciation students begin associating a variety of works with their titles and composers such as Bach, Beethoven, Brahms and others. “Carrying no illusions about matching any of the above,” Hillstrom is still an active composer. His recent work includes the McHenry County College Graduation March, a fight song called the MCC Rouser, and the music for Jay Geller’s What Am I Going to Do Now? (performing in MCC’s Black Box Theatre on Jan. 27 and 28; Feb. 3 and 4). When he’s not working as a musician or teacher, Hillstrom enjoys rooting for the Minnesota Twins and Chicago Cubs. (He still hasn’t decided whether or not he prefers music to baseball.) So when you see him, test his knowledge of baseball trivia by asking him for the results of any World Series.